# What is CFD Indices markets ? CFDs are financial instrument that provide a way of entering various markets including stock market, without actually buying any shares or currencies etc. The index is composed of several stocks of companies that are traded on the stock exchange. As rule index contains most successful companies in the country. 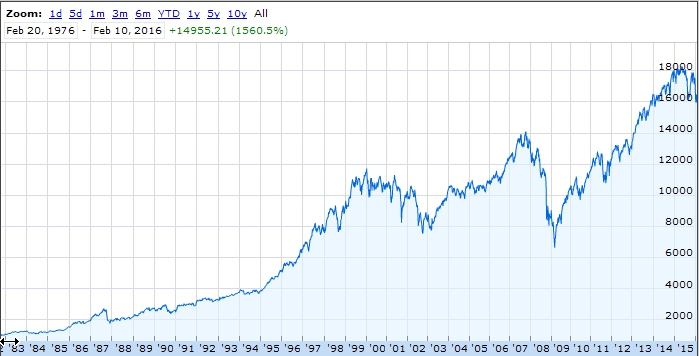 For example index S&P 500 contains top 500 companies in USA. Index is simple path to invest in country economic with minimal risks and profits about 10% in good year. The priority of any country and growth of the companies to attract new capital and an endless cycle of development. Index must be rise!!! See chart grow for last 50 years. 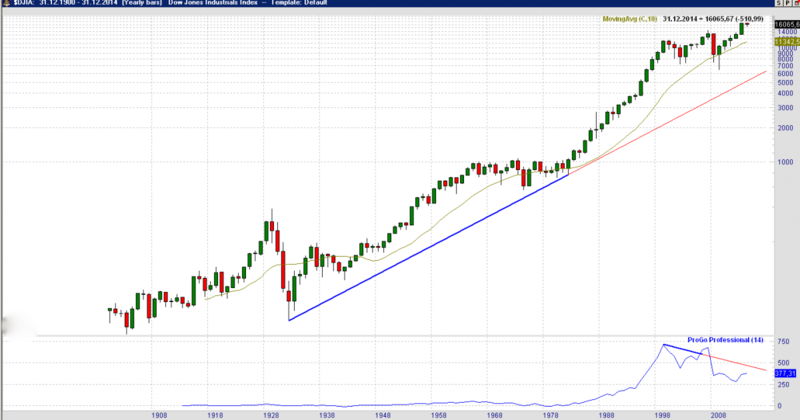 As seen on chart the index long time is growing and rapidly falls. According to statistics, 30% of the time the index is falling and trends in 70% of the time trends of consolidation and growth. For this reasons investing in CFD indices safer and simpler than any other market. 1. Open account. For CFD trading need open account with CFD broker. Good CFD Broker is primarily low spreads. We recommend service London Capital Group. His spreads 0.4-0.9 points. When account opened, need strategy which make money every day. We provides M15 strategy from company World Stocks. Start getting the signals right now subscribing to the M15 signals the world's leading indices. 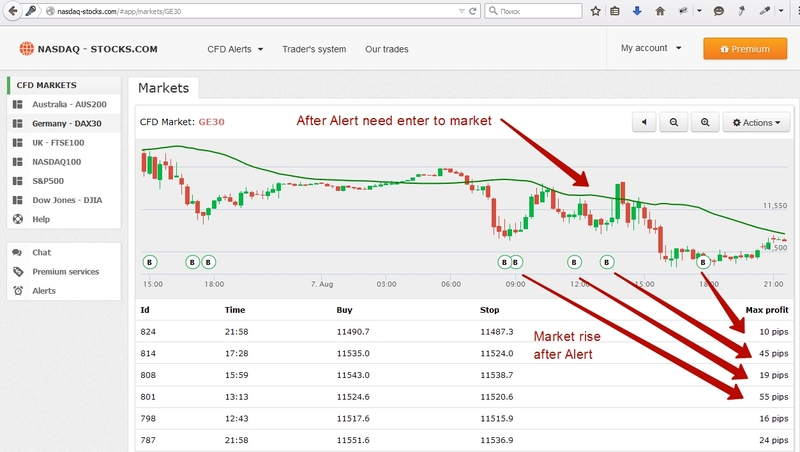 Today alerts works with next CFD markets: DAX30, FTSE100, NASDAQ-100, S&P500, ASX-200, Dow Jones. 2. Commissions difference. Trade strategy with M15 charts very sensitive to the spread and broker's commissions. Killer of any strategy is the high spread. Because for short periods of time we fix for 5-10 points profit, and if we pays 3 or better points to broker for deal we loss all money in future. Range spreads that suit us beetwen 0.5-1.2 points. If spreads will be better your profit get your broker instead you. And you get onle losses. Trade with only approved brokers. Comfortable leverage to work with indices of 1: 100. Every day the indices go up and down by 100-200 points. This is enough to increase the capital by 5-10% on the day. The Alert is recommendation to enter the market in current time. The structure of the input Alert: Time band to enter market, as usually in next 15 min. And the recommendation to conduct the transaction. On screen with NASDAQ-STOCKS Alerts you can see how make money in short time term. 2. How to enter with Alert? So you login to the site, issued a premium subscription to the alerts, and then you see the on-line alert. Now we provides only BUY Alerts. You can on/off sounds Alerts and when will be start action to buy you will hear it. It is not necessary to monitoring charts of the eyes. From monitoring charts can be much tired. 3. How risks we trade? 5. How to close positions? Positive scenario. 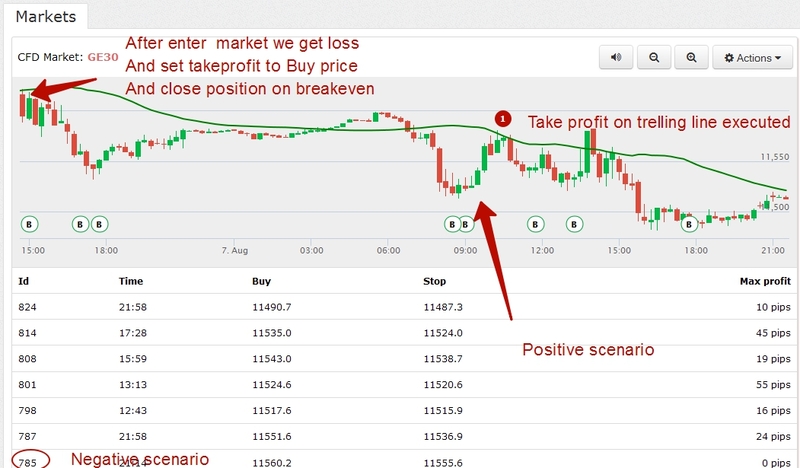 Close positions very simple, you may set takeprofits about 10 points. Second path to exit from market by trelling line on chart. If enter price lower than 10 points to trelling stop your takeprofit set on this line price and be sure it wil be executed. Negative scenario. If your position loss money better 7-10 points, you set take profit on breakeven level (enter price). And wait new alerts. 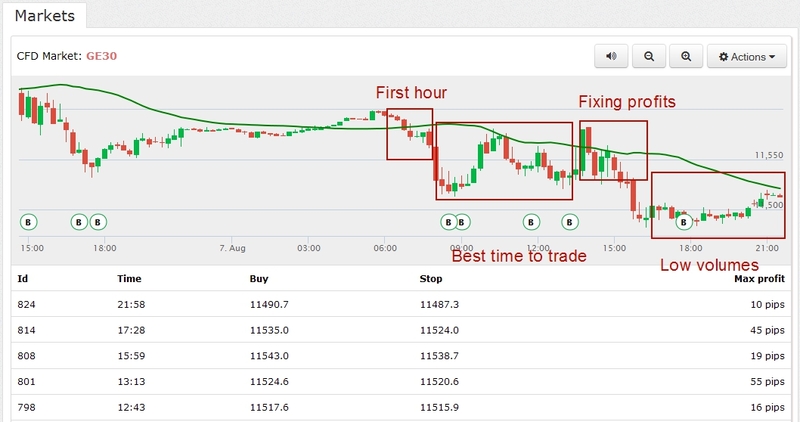 Trade better in the morning, after the first hour, after the start of trading. In the first hour is usually small orders and trading without leverage on low volumes, people who urgently needs to buy or sell. This market is the most difficult to forecast. Then comes the best time because the largest transaction carried out at this time. After dinner there is the fixation of profits, and in the late afternoon volumes are very low. Therefore, in the afternoon there is a large market and get the intensity of profit harder. Choose the right trading hours if you prefer to trade in the evening, take another market which is active in your time tonight. If you trade the first year, and you can not wait to enter the trade, trade not every day, such as Monday, Wednesday and Friday, it will help you learn to wait more than a desire to enter into the transaction. Real trades profits with CFD Alert, about +90 pips per morning or $200 return. © 2014 - 2019 WS-ALERTS.COM all rights reserved.